Welcome to the RC8B3 Wiki! Feel free to share Tips, Tricks, and anything else beneficial to the RC8B3 nation! Ebay will get you a better bang for the buck. Lots of guys strip down kits and sell parts lots. You will need to do a little research as prices are all over the map and if you get a bunch of crap form different sellers, the shipping will reduce the savings. nitromaster on Ebay is usually pretty good on prices and combines shipping. Sometimes the price of buying things like a whole set of shocks makes sense, when you figure you are getting, shafts, spring cups, shock ends, seals etc. so keep that in mind. 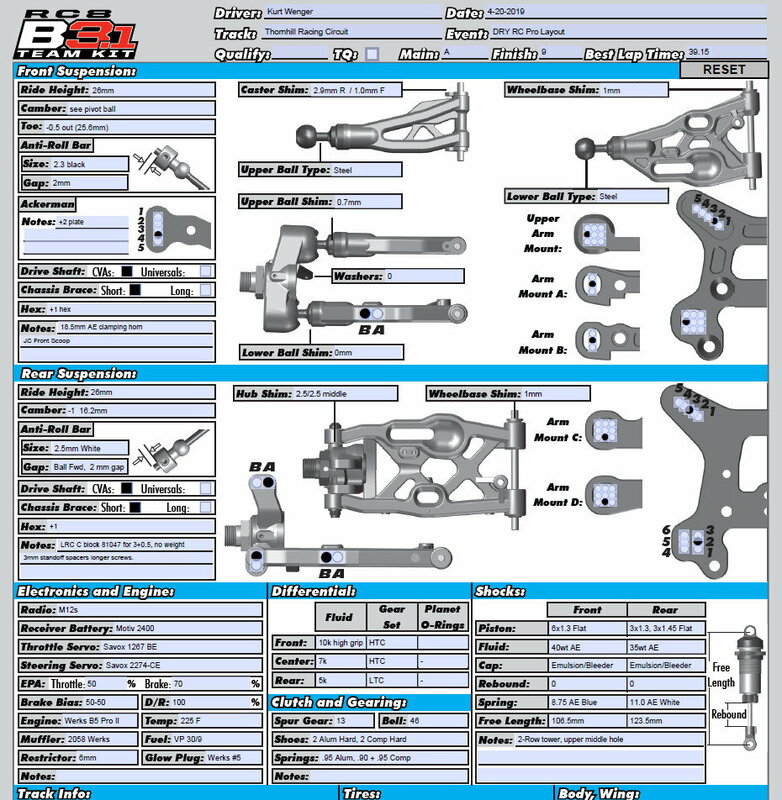 Remember the 3.0 arms are a little different, as are the ABC and D blocks, and driveshafts. Any feedback on the new adjustable 4 shoe clutch yet? I'm not sure if I need this $50 flywheel in my life. How do you fix the broken screws in clutch assembly? The head on the screw holding clutch shoe and spring broke of can’t figure how to get rest of pin out to reuse clutch system . Cut the screw out. You will probably lose a spring but might be able to save the shoe. Tips for assembling the clutch pins.. no thread lock and don't over-tighten them. Just hand snug is fine. The rotation of the crank will naturally want to tighten them. I find that most of the time when they break, its because they were too tight. Have broken many.. Probably in the 5 to 7 range. Unfortunately, I just trash it. Hard to justify the time to get the screw out. But, I do install new screws often now. So, after snapping yet another screw, I thought about this thread today. Since almost all of the threaded part comes out when it breaks, I bent the shoe as far back as possible, which in turn , loosened the last bit of thread enough to remove it with pliers. Came out really easy. I have not broken one yet. I use a very light amount of anti sieze on the clutch pin threads. The threads have nothing to do with it breaking. The Pin fully floats and holds the spring. This is why most of the threads come out. Run yours much longer, it'll break. Could some one throw calipers on the 'shock bushing' (where the upper shock mounts too) and tell me the diameter of it is. Mine has a ton of slop and I dont know if it's the cap or mount. So the pin is bending you are saying? I have been proactively changing the pins when they start getting hammered.. they are certainly a wear item. Does anyone make a lightweight (steel) spur gear yet? Thx! I unthread the screw head when it breaks. Then to get the shaft out, use the blade on your xacto, dig into the pin near the spring coil, and you can walk the shaft out a little at a time. Never had to trash a spring or shoe and I've done this 3 times. I was just emailing the AE guys to switch to 1.5mm hex on the screw head so the thin wall from 2mm hex won't break so easily.